Last week, I added another Mac to my collection: a Power Macintosh G3 blue and white model, running at 350 Mhz with 128 MB of RAM and with OS 8.6 installed. I knew someone who had a few extra G3 B&Ws sitting around, and they were kind enough to let me walk away with one. I’ve always admired the B&W case design, since it launched the venerable G4 aesthetic – but now that I have one, what do I do with it? First, having never owned an OS 8 Mac, I wanted to poke around the system and see what came stock on it. Here’s the “About This Mac” section – showing the basics. 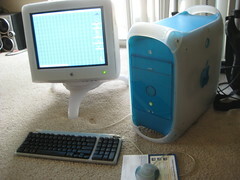 Mac OS 8.6, code-named “Veronica,” was the last version of OS 8 Apple released. 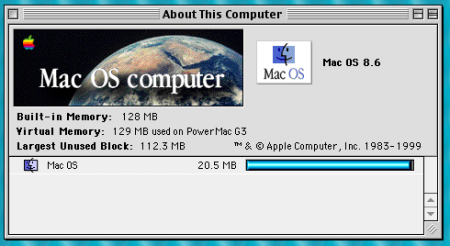 This PowerMac has less RAM than my iMac G3, but a faster processor and a similar-sized hard drive (6 GB). 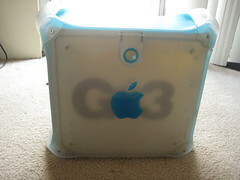 This G3 came pre-installed with the basic OS 8.6 software, meaning there’s not much in the way of applications. Sherlock is here, as is QuickTime and all the Apple basics. This is Apple’s own CD player app, pre-iTunes. Lovely, isn’t it? Web surfing in OS 8 means Microsoft Internet Explorer 4.5 (above). Nice to know that Newton Poetry looks decent even on a 1997-era browser. Just for fun, I also downloaded the last version of Netscape OS 8 could handle, and Mozilla’s original web browser. I find either of these browsers can handle basic web sites well. Now, what to do with the bugger? My first thought is, it’s nice to have an OS 8 Mac around just to play with. Right now I have a Macs with every version of the Mac OS, from 8.6 up to 10.4. I’ve also thought about using the B&W as a file server – just an extra place to keep backup files or something. I’ve read a lot about other Mac users doing this, but I’ll have to find a bigger hard drive. A measly 6 GB isn’t going to cut it. A RAM upgrade might be needed as well. 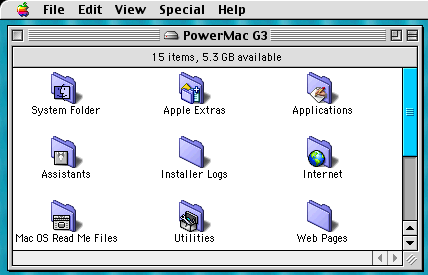 For now, though, the Power Macintosh G3 joins my PowerMac G4 in being a project machine. Any suggestions? Posted by davelawrence8 at 6:15 am on March 9th, 2009. 5 comments... » Categories: lowend, macs. Tags: apple, B&W, blue and white, G3, mac, os 8.6, power macintosh, powermac. Subscribe via RSS. If you turn your B&W G3 into a file server, be careful when adding/swapping a larger drive. The Rev. 2 motherboards allow this; Rev. 1 does not (at least, not without some data errors). Here’s a page with a photo that allows you to tell them apart. The page deals specifically with an upgrade to OS X, but the drive problems will be there in Rev. 1 motherboards whether or not you upgrade the OS. Posted by Middle aged Mac guy on March 9th, 2009. If you have space to hide the unit near your TV, grab an older EyeTV USB unit (around $30 on eBay) and copy all of your music files to it, then grab an ATI Wonder Remote (around $20 on eBay). Then you can use it to watch TV and play music in the room. I have a graphite iMac DV setup exactly this way in the kitchen – the iMac “looks like a TV” more than your G3, but you get the idea. Posted by Steve on March 9th, 2009. Thanks, guys. @Middle Aged – I had heard the Rev. 1s were kind of flaky. Kind of like the older G4s will only allow up to 128 GB hard drives. @Steve – that sounds like a fun project. I’ve wanted to learn how to hook up a Mac to a TV for some time now, anyway. Posted by davelawrence8 on March 9th, 2009. This was my first non beige Mac. I had bought mine for $300 from Mac of All Trades and used it to replace my Performa 6200CD. I remember using that CD player in OS 8 many times in college. Before selling this machine I had it up to 10.3 running on it, but it go its most use with 10.2 and classic running back when it was my main machine. I miss it. Posted by Vince LoGreco on March 11th, 2009. Posted by Blake Patterson on March 12th, 2009.